Do Vegetables Lose Their Nutrients When Baked? Whether you are preparing for a back country hiking and camping trip or stocking up on your emergency supplies, choosing organic ensures you won’t consume genetically modified or pesticide treated food. Organic survival foods are available at grocery stores, outdoor activity stores, military surplus stores and from a variety of online retailers. Outdoor sports stores sell freeze-dried backpacker meals, which can be reconstituted with hot water. Organic options are available, though they are still much rarer than conventional versions. Freeze-dried foods tend to be expensive, costing more per pound of prepared food than dehydrated or canned foods. 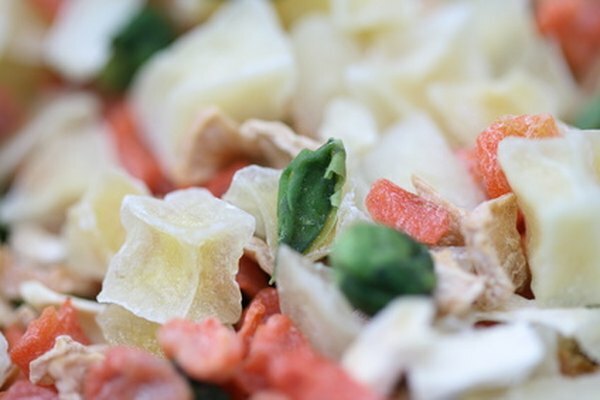 However, in a situation where you cannot remain at your home, freeze-dried foods are lightweight and easy to carry and require less water to cook than dehydrated foods. Emergency and survival preparedness stores sell organic bulk freeze-dried foods in buckets and cans. Organic bulk freeze-dried foods are cheaper than organic backpacker meals, and come as single food items rather than prepared meals. You can combine these items to make a complete meal rather than relying on the food combinations available in backpacker meals. Any canned fruits, vegetables, beans or other organic foods can be part of a survival kit. Rotate your canned goods into your regular food supply as their expiration dates near and replace them with new canned goods. Canned food is ideal in situations where you are staying at home but can’t access a grocery store, as they are heavy and bulky. Dehydrated foods such as dried fruit, bulk grains, beans and soup mixes are now available in organic versions. For emergency storage, empty large bags of organic dry goods from the grocery store into plastic storage buckets containing oxygen absorbers and monitor regularly for degradation or rancidity. You may also purchase organic dry goods in airtight cans or buckets from emergency preparedness suppliers. The freshest organic survival foods come out of your own garden. When you eat food from your garden, you are assured that you are eating the product of just water, sunlight, soil and organic fertilizers. Survival garden kits emphasize heirloom, or non-hybridized, seeds so that you can collect the seeds from your food and plant them the next year.